Last December, a unique first-draft manuscript of the lyrics to Bruce Springsteen’s 1975 hit song “Born to Run” was placed up for auction at Sotheby’s. The seller of the document remained anonymous, but it was known that the manuscript once belonged to Mike Appel, Springsteen’s former manager. The bids poured in online, in person, and by phone, and one happy bidder went home with a piece of American music history. That successful purchaser happened to be Floyd Bradley, a leadership donor to the Duke University Libraries and the Nasher Museum of Art, whose parents met in 1942 while students at Duke. The Bradley and Springsteen families actually share a number of connections. Mr. Bradley’s mother Carol Lake Bradley (WC’43) and Mr. Springsteen’s mother were neighbors and friends in New Jersey. Mr. Bradley’s father, Floyd Henry “Pete” Bradley, Jr. (T’45), sold his house to Mr. Springsteen’s mother-in-law. Mr. Bradley is also a proud Duke father whose daughter, Melissa, is a graduating senior this year. And so it came about, through special arrangement with Mr. Bradley and his wife Martha Hummer-Bradley, that the “Born to Run” manuscript will be on public display during Duke’s Commencement Weekend in honor of Melissa’s graduation. The first draft manuscript of Bruce Springsteen’s “Born to Run” will be displayed in Perkins Library. Image courtesy of Sotheby’s. Click for high-res version. The document will be exhibited in front of the Circulation Desk on the Perkins Library main floor Thursday and Friday, May 8-9, from 9:00 a.m. to 6:00 p.m., and Saturday and Sunday, May 10-11, from 1:00 p.m. to 5:00 p.m.
After May 11, the manuscript will be moved to the third floor of Perkins, where it will remain on display in the David M. Rubenstein Rare Book & Manuscript Library until June 27 and be available to view during normal library hours. 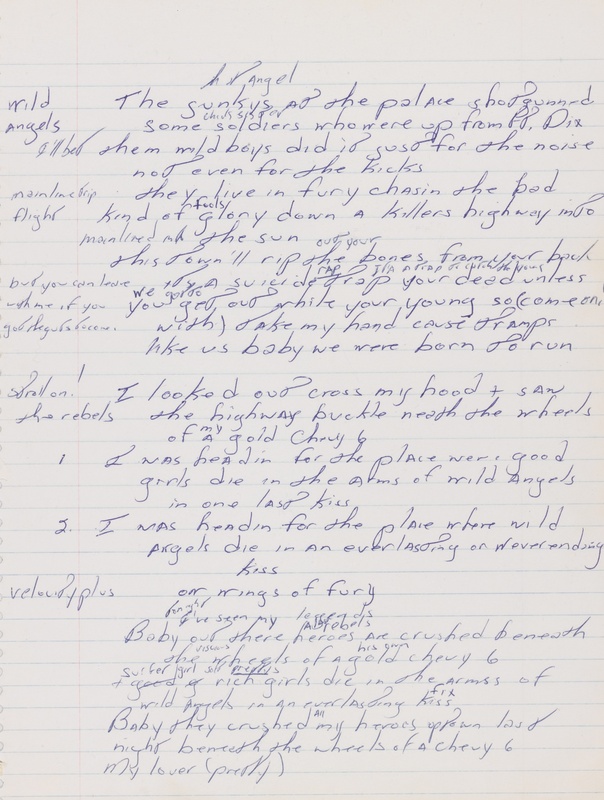 The “Born to Run” manuscript, written by Springsteen in 1974 in Long Branch, New Jersey, may look like nothing more than a piece of notebook paper scrawled with thirty lines of blue ink. But it offers a glimpse into the creative process of a musical icon. The draft contains a great deal of material that was never included in the final version. Yet the chorus is nearly identical to what we hear in the finished song. The margins and spaces are crowded with second thoughts and edits, illuminating the moments in which a rock and roll anthem was born. Visitors to campus are invited to stop by the library and view this special piece of music history. Ticket stub from Springsteen’s performance at Duke’s Cameron Indoor Stadium in March 1976, just a few months after “Born to Run” was released. Image from Brucebase. Please note: During the summer, all Duke University libraries are open on a more limited schedule than during the academic year. Please check our online schedule of library hours before visiting. Thursday and Friday, 9:00 a.m. – 6:00 p.m.
Saturday and Sunday, 1:00 p.m. – 5:00 p.m.
Not sure if the author is aware, or if this was omitted on purpose, but Jessica Springsteen, Bruce’s daughter, will also be graduating this weekend. I’m sure that may have provided additional incentive to display this at this time. Wonderful! I could get there to see it in person. Poetry and process, how thoughtful of the Bradley family. My favorite artist displayed in my favorite spot. His daughter goes to Duke as well. Too bad you included a video of “Born to Run” from when after Springsteen started working out. I was at the concert on the ticket stub, and he was a bearded, scrawny guy back then. Still put on a great show, though. I had connections at the box office, got 5th row tickets (Springsteen’s people had the first four) and invited the guy I had a crush on. He was a big Springsteen fan and I was hoping to win his heart. It worked, he’s beside me now, 38 years later. Good times!